“Bo” presented in August 2016 to current for the chief complaint. He had an injury and became unstable on his hind end. However, the disease became progressive over the next 2 years. After diagnostics and medications, the owner was willing to try other therapeutic modalities. Laser and acupuncture were used on Bo. Although Bo still has weakness, he does use his tail more since treatments have been started. 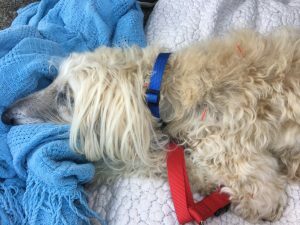 The owner has also noticed some change in activity when on walks and ambulation around her home. “Bo” is a 12 1/2 year old neutered male Afghan Hound. He has been a patient at the Veterinary Hospital since he was a puppy. His presenting complaint in August 2016 was injury to the left hind 1 week previous and painful/unsteady in hips with difficulty rising. At that time patient was on Metacam. Returned in June 2017 for exam with presenting complaint that legs are worsening. Lab work performed and consultation with orthopedic surgeon at that time. Discussed probable progressive degenerative neuropathy. Patient was started on Adequan injections and supplements at home (standard process musculoskeletal support, VRS osteo, VRS cognitive omega). In October 2017, additional lab work and radiographs were performed. In November 2017, owner inquired about acupuncture (was referred to acupuncture specialists in the area). However, owner didn’t proceed with therapeutic modalities (acupuncture) at that time. Patient was continued on Thyro-tabs, Metacam, Adequan, Gabapentin, and musculoskeletal supplements (mentioned above). Acupuncture and laser therapy were started in May 2018. LAB WORK FINDINGS: Hypothyroidism diagnosed in 2014. No other clinically significant labs to case (CBC – complete blood count, Chemistry panel, U/A – urinalysis, 4DX – heartworm test with tick borne diseases). RADIOGRAPHIC FINDINGS: Mild to moderate spondylosis at T5-6 and T6-7. Mild T11-12 intervertebral disk space narrowing. Unremarkable pelvis. Effusion bilaterally in stifle joints. Osseous lesion in distal left femoral metaphysis. Mineralization within the joints (worse on left). Radiologist suggests bilateral cranial cruciate ligament injuries with possible small avulsion fracture of cruciate ligament or meniscal mineralization to explain findings in stifles. No further diagnostics imaging was performed and neurology consult was not pursued. Therefore unable to make definitive neurologic diagnosis. Suspect progressive neuropathy due to orthopedic surgeon consult in clinic or IVDD at T-L region (thoracolumbar level) due to radiographic findings. Possible cruciate ligament disease due to radiologist interpretation. The idea behind the protocol is to hopefully slow the progression of the suspected neurologic disease, make patient more comfortable, and reduce pain and inflammation. GV 20, GV 14, and bai hui were placed first at every visit. The first visit these points were used to see how Bo would tolerate needling. They were also used for the autonomic input and the resulting relaxation effect. ST 36 used for parasympathomimetic neuromodulation, pelvic limb dysfunction, and spinal pain. ST 36 benefits also includes anti-inflammatory effects and gastrointestinal health. Bo has history of diarrhea so ST 36 assists in GI health via effects on the vagosympathetic trunk as the point ascends to the nucleus tractus solitarius and helps with GI motility. Points along the bladder line were uses sympathetic routes to influence. BL 21 and BL 25 used for local lumbar sensitivity as well as digestive problems (diarrhea history). BL 27 used as back shu for small intestine, local tender point, and parasympathetic innervation through vagus. BL 27 and BL 28 used for sacroiliac dysfunction. BL 35 used for sacral pain and tail dysfunction since Bo has a low tail carriage and minimal to no tail function/“wag”. This point was complimented by GVT and GVT/3 for peripheral nerve dysfunction of the tail. BL 54 used for possible sciatic nerve dysfunction and hip and gluteal pain. Bai hui, GB 29, and BL 54 used for history of hip dysfunction. Bai hui also used for lumbosacral pain, pelvic limb neurologic dysfunction, and to compliment bladder line points. LI 11 used for local pain, anti-inflammatory effects, and immune modulation effects. The main goal for Bo was to improve comfort and assist with ambulation. 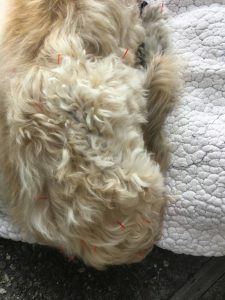 Initial acupuncture and laser treatment (5/4/18) – Performed at owner’s home since patient is very nervous at the vet clinic. Patient is comfortable in the living room on his bed for the acupuncture treatment and laser performed in backyard. Red seirin needles (0.16×30 mm). GV 20, GV 14, bai hui, GB 21, BL 21, BL 25, BL 27, BL 35, GVT (tip of tail), GVT/3, ST 36 (right hind). Dry needling for 20-25 minutes. Laser (companion class 4) performed on lumbosacral region, hips, stifles bilaterally, and neck on osteoarthritis (OA) setting at 9W for 6 minutes each (continuous wave with 980nm and 810nm wavelengths). Bo enjoyed his initial therapy and needles seem appropriate size. Consider blue needles with electrical stimulation in the future. Second acupuncture and laser treatment (5/14/18) – Patient came to the veterinary clinic for the second treatment. Owner brought patient’s bed and he laid on it outside the clinic near a bench. Red seirin needles (0.16×30 mm). GV 20, GV 14, bai hui, GB 21, BL 21, BL 25, BL 27, BL 28, BL 35, BL 54 (right), GVT (tip of tail), GVT/3, ST 36 (right hind), bafeng (right hind). Dry needling for 20-25 minutes. Laser (companion class 4) performed on lumbosacral region/pelvis, right stifle, and dorsal neck on OA setting at 9W for 6 minutes each (continuous wave with 980nm and 810nm wavelengths). Third acupuncture and laser treatment (5/18/18) – Red seirin needles (0.16×30 mm). GV 20, GV 14, bai hui, GB 21, BL 21, BL 25, BL 27, BL 35, GVT (tip of tail), GVT/3, ST 36 (right hind), LI 11 (left). No laser performed today because patient seemed more nervous than usual and uncomfortable, and he only tolerated needles for a short time (5-10 minutes). Elected to wait until next visit. Told owner to schedule a morning appointment for next visit. Fourth acupuncture and laser treatment (5/30/18) – Patient came to the veterinary clinic. Owner brought patient’s bed and he laid on it outside the clinic near a bench. Red seirin needles (0.16×30 mm). GV 20, GV 14, LI 11 (L), BL 10, bai hui, GB 21, BL 18 (R), BL 21, BL 23, BL 25, BL 27, BL 28, GVT (tip of tail), GVT/3, ST 36, ST 34 (L), SP 10 (L), bafeng. Dry needling for 20-25 minutes. Laser (companion class 4) performed on lumbosacral region/pelvis, left stifle, and neck on OA setting at 9W for 6 minutes each (continuous wave with 980nm and 810nm wavelengths). Fifth acupuncture and laser treatment (6/12/18) – Patient came to the veterinary clinic. 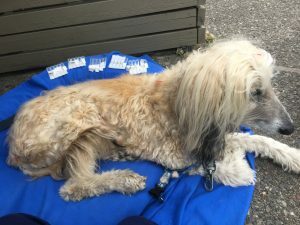 Owner brought patient’s bed and he laid on it outside the clinic near a bench. Red seirin needles (0.16×30 mm). GV 20, GV 14, LI 11 (R), BL 10, bai hui, GB 21, BL 18, BL 21, BL 23, BL 25, BL 27, BL 28, GVT (tip of tail), GVT/3, ST 36, bafeng. Dry needling for 20-25 minutes. Laser (companion class 4) performed on lumbosacral region/pelvis, stifles, and neck on OA setting at 9W for 6 minutes each (continuous wave with 980nm and 810nm wavelengths). Sixth acupuncture and laser treatment (7/2/18) – Patient came to the veterinary clinic. 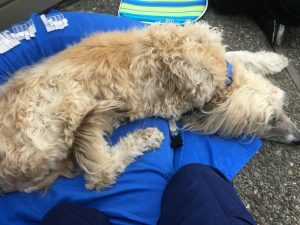 Owner brought patient’s bed and he laid on it outside the clinic near a bench. Blue seirin needles (0.20×30 mm) – GV 14, bai hui, GB 21, BL 18, BL 21, BL 23, BL 25, BL 27, BL 28, ST 36 (R), BL 54 (R). Estim (electrical stimulation) at low frequency and 1.5 Hz from BL 21 to BL 28 with ITO unit for 20 minutes. Red seirin needles (0.16x30mm) – GVT (tip of tail), GVT/3, BL 10, GV 20, BL 35 (R), bafeng (R). Dry needling for 20-25 minutes. Laser (companion class 4) performed on lumbar/hip, stifles, and neck on OA setting at 9W for 6 minutes each (continuous wave with 980nm and 810nm wavelengths). 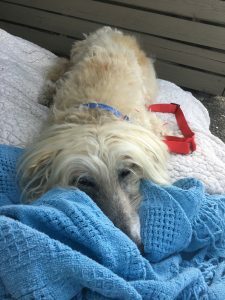 Prior to acupuncture and laser treatments, the owner reported that Bo had no movement of tail for at least 6 months (but may be closer to a year). Since the treatments, Bo has started to “wag” his tail at other dogs and people. The owner takes great pleasure in counting his “wags” now that he has started again. The return of movement to the tail can be attributed to the acupuncture treatments. It appears more research could be performed in the area of acupuncture effects on hindlimb gait and tail movement. Using Pubmed to search current research and literature, papers in this area with sufficient positive evidence seem to be lacking. Papers found state that there is no or weak evidence in support of acupuncture in cases similar to Bo’s. However, literature listed below helped in the decision making of points as well as addition of electrical stimulation. 2. Napadow V, Ahn A, Longhurst J, et al. The status and future of acupuncture mechanism research. Journal of Alternative and Complementary Medicine. 2008; 14(7):861-869. 3. Langevin HM. Yandow JA. Relationship of acupuncture points and meridians to connective tissue planes. Anat Rec. 2002; 269:257-265. Bo would relax during the treatments as you can see in the attached photos. However, what we learned was that Bo had to be in the correct environment for his treatments in order for him to be comfortable (outside the vet clinic, in the morning, couldn’t be too warm, his own bed and blankets for comfort). We also knew when he wasn’t in the right mindset (for example session 3) and we decided not to “push it” when he wasn’t feeling up for the treatment. Bo has taught me some very useful lessons to use in future patients.